A Package is a collection of predefined classes and interfaces. Using packages, classes can be partitioned into smaller units on the basis of their functionality. Basically, packages in Java are folders or directories in file system, containing class files and sub directories. 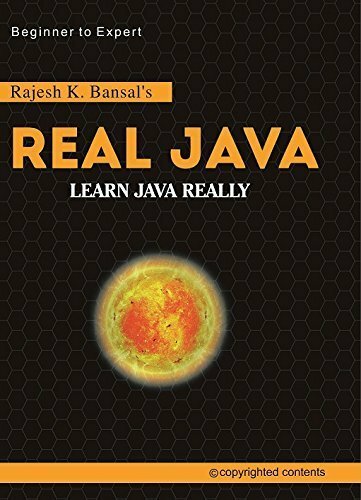 For example, the most important package in Java API is java.lang because without it, a Java program cannot be developed. Here, java is a package and lang is its sub package. It consists of commonly used classes i.e. Object, String, Math, Class, Thread, Exception, Runnable, RuntimeException, etc. and various wrapper classes like Integer, Double, Float, Character, etc. A compilation unit is a source code file of Java (also known as translation unit). Each compilation unit must have a name, ending with .java extension. A compilation unit can have a public class that must have same name as the fi le name. Only one class can be declared public in a compilation unit, otherwise the complier will show error message. If a compilation unit contains additional non-public classes, they will be hidden from the outside world but can be used as support classes to the main public class. A sub-package is a subdirectory or a sub-folder that may also contain compilation unit and sub-package of its own. A package declaration in a compilation unit specifies the name of the package to which the compilation unit belongs. A compilation unit without package declaration part belongs to unnamed package. Unnamed package is also known as default package or anonymous package. Most of the examples in this site use single file without package declaration, it means, these example programs belongs to unnamed package. 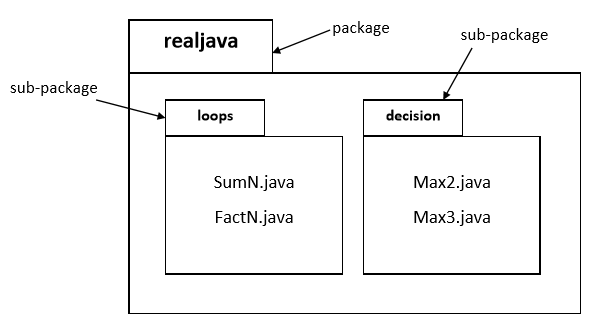 Create folder(package) "realjava" having 2 sub folders(sub-packages) "loops" and "decisions" in "jdk/bin" folder. SumN.java : for sum of n natural numbers. FactN.java : for factorial of n.
Max2.java : for greater of 2 numbers. Max3.java : for greatest of 3 numbers. Compile and interprete the program(UsePack.java) to see the expected output. Import declaration statement(if any) must be the first statement after package declaration statement in your program. In this example p.A.AA and p.B.AA are fully qualified names but only p.A.AA is canonical name. The above statement avails class ArrayList only from java.util package in the compilation unit. A type-import-on-demand declaration avails all the types (classes, interfaces) to the compilation unit. The above statement will avail all the public types to the compilation unit for use. Each compilation unit automatically imports all the public types declared in the predefined package java.lang. Using import statement to access the static members of a type (class,interface) from packages is often called static import.Using a single static import declaration, you can avail only one static member(field, method, class,interface).It means that for multiple static members, you will need multiple single-static-import declarations. It avails all static members of a type to the compilation unit.